TANDOORI CHICKEN (Sp) – our most famous appetizer! – Chicken leg quarters marinated overnight in a special spice mix of 27 spices and cooked in a tandoor. – Boneless pieces of chicken marinated in a yogurt based spice mix and cooked over glowing charcoal. 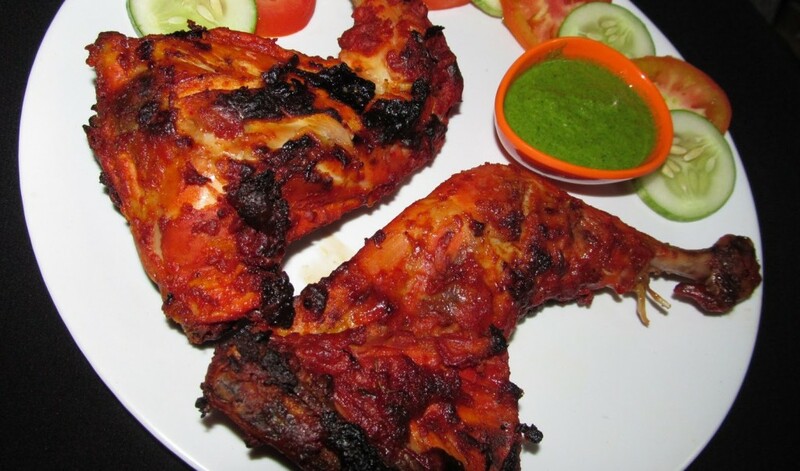 – Boneless pieces of chicken, flavored with achar (pickle) and fresh spices and grilled on charcoal in a tandoor. – Minced chicken flavored with black cumin & saffron, and cooked on charcoal. – Boneless pieces of chicken marinated in yogurt & mint-cooked over glowing charcoal. – Juicy chicken pieces marinated overnight in yogurt & garlic, enhanced with special Indian spices and cooked over glowing charcoal. – Bite sized pieces of boneless chicken, dipped in a marinade of yogurt, cream & cheese-cooked over glowing charcoal. – Boneless chicken cubes sautéed with onions and a spicy pepper based sauce. – Ground lamb/goat meat flattened and shallow fried. A specially in nawabi cuisine. – Finely minced lamb/goat meat blended with our chef’s own combination of herbs & spices, skewered & cooked over glowing charcoal. – Succulent lamb/goat meat chunks marinated overnight and cooked in tandoor over charcoal flames.